Lia Soetoro Sobah Speaks–In her own words . . .
“Lia, a nickname. She lived at the family home of Lolo Soetoro for 15 years. And four years of which she spent in the company of a black kid who came from Hawaii. The boy was brought by his mother, a beautiful white woman, Ann Dunham, who was married to Lolo Soetoro, a manager at Pertamina. Barry, the boy’s nickname, was about six years old. Lia, who he called Sister Miss, was asked by the couple, Lolo Soetoro and Ann Dunham, to protect and accompany Barry. But who would have thought that Barry, a black boy who often asked her to play ‘mouse-tikusan’, has now become the U.S. president-elect? Part Two: “Barry (Obama’s nickname) was happiest when asked to walk along the summit area. He brought home, from there, cake that he often bought–Mochi, a type of sweet snack smeared with flour, in a small basket placed in a box. Barry bought in quantity, mochi-mochi, seemingly, to share with children around his home village. So there you have it. In her own words. Make of these introductory translations what you can and will. Some are difficult to decipher. I look forward to hearing from anyone who can translate and transcribe the actual interviews for us. However, it certainly sounds plausible that not only did Lia live with Barry for years, she also remembers much about their time together. Detailed memories, capable of being verified. Names, locations, visitors to the house. Witnesses who could corroborate what Lia says. She even retains many of Barry’s belongings from those days, including, if I’m reading correctly, vomit-stained blankets! She shows the blankets and other artifacts to the reporter. DNA, anyone? Some have questioned the authenticity of Lia’s memories. Is she a charlatan, out for her 15 minutes of fame? Perhaps. But she must be (strike that: must HAVE BEEN) a very clever and daring person, to have invented such detailed memories. Memories that ring true and which hang together. Especially since the Indonesian media were taking her seriously and could easily do the legwork necessary to try to authenticate what she said. After all, they had well over a year from the time of these “inaugural” interviews until the time of her death, in Feb. 2010. This entry was posted in Biographies and Selected Persons, Mug Shots, Natural Born Citizen Discussion, Obama Family and tagged Ann Dunham, Barack Obama, Barry Obama, Indonesia, Lia, Lia Sobah, Lia Soetoro, Lia Soetoro Sobah, Lolo Soetoro, Natural Born Citizen, Non Mbak, Obama's adopted sister Lia, Sister Non, Stanley Ann Dunham. Bookmark the permalink. Could it be Barry does not remember this lady because this BHO was not there? Take a look at these pics in Pakistani news today of a younger and a current BHO/Barry Soetoro. They are NOT the same person. Very strong resemblence but check the ears out. The younger pic is the first Adult pic of BO that actually looks like the little kid in the Indonesian school pic. So, maybe there was/is a Soetora AND a Obama. And one became the other, for whatever reason. And that would mean there could be both a HI cert and a Kenyan one — one for each kid. I have no idea what this article is about and could very well just be showing an O. look alike, but in any event I do have screen shots since most likely will be scrubbed by end of the day. Ali, it was in her comment above. Hi Yo ! Welcome here. Maybe twins ? Lolo kept one and SAD kept one ? That’s the translation of yo’s link. It’s a story about a 36-year-old INDONESIAN Obama lookalike. Now what’s fascinating is just HOW MUCH this man resembles Barry, which lends more credence to any theory that Barry isn’t even African-anything–he could be Indonesian, Polynesian, “desi”, etc. This man may also be someone whose image was used as the basis for the photoshopping we see. Or just some other kid who happens to resemble Barry. Sounds like Lia last saw o in ’76, if I am reading this correctly. She worked for Lolo til ’81. Leah clearly states in this article that she went with O, Lolo, Ann, to Hawaii for 3 months. I cannot get over how cruel Maya was in denying any knowledge re Lia, in calling Lia a fraud — have they no souls? “…Leah is a caregiver at the same time Barry teammates in Jakarta. Obama used to call Miss Non. Leah was brought to Hawaii when Barry moved from Jakarta to Hawaii. This article is even MORE detailed in discussing her 3 month stay with o and grandma (toot) in Hawaii. Good Finds Ali! This is the translation. Note this is right after the election. Spelling of her name is both Leah and Lia in this article. DURING the three months to live with Barry’s family in Hawaii, United States, late in 1970, is a moment of fun and dramatic for Mrs. Leah (51) aka Mbak Non, adoptive brother Obama. On Friday (7 / 11), Warta Kota took Leah visited at his home in Cibadak beautiful, Sukabumi, West Java. Accompanied by her husband, Eddie Soba (58), he recounted moments of fun and dramatic to the days of her last day with Barry. According to him, about 3.5 years to be adopted at once best friend’s brother Barry, the most moving moment in their relationship was when Leah asked to go to Hawaii, U.S., along with Barry’s family, but sad because he had to go back to Indonesia without accompanied his adopted brother who was also at the same time a friend of her childhood. “Barry is a true sehabat my childhood. Only she was my only time it’s because we were always together, good shower, eat, or sleep, When will split up, like there is something missing in me time, “he said. He claimed, for three months in Hawaii, the U.S., he never left the shadow of Barry. “We were always together. Barry always took my hand everywhere we go. He taught me many things, “he said. Leah remembered well how Barry taught him ride an escalator in a mall in Hawaii. “I fear all the time. In fact, I had fallen when it was first escalator ride. Fortunately Barry’s holding my hand tightly. He pulled me when I fall. When it seems Barry is my savior, “he said. In Hawaii for three months Lia visited many places, such as the Zoo, a variety of malls and shops, swimming pools, and beaches. “On the beach Barry burying himself in sand and I was told to stay with. However, I was overheated and pleaded with Barry so do not bury themselves again in the sand. Fortunately he obeyed, “he said. Since it is considered by one venter, Barry’s grandmother often assume them both and sat on her grandmother’s thigh. “I sat on the other thigh, Barry sat in his thigh the other grandmothers. The most I remember from grandma when Barry was hugging us both very warm and very intimate. Like the arms of an angel or fairy. Anyway soothing embrace us, “he said. Really great find, Ali. It’s amazing the amount of detail. If she’s not telling the truth, then she certainly has an inventive imagination, which, when you think about it, might argue for a theory that she’s biologically related to Barry, who himself certainly is inventive. Fantasy biography and all. Maybe that trait runs in the family. It’s not surprising, perhaps, that Maya doesn’t remember Lia. She was only a baby or toddler, at best, at the time of the Hawaii trip. But since Maya herself went to boarding school in Indonesia, when older, and since she admits to staying in touch with the numerous Martodihardjo cousins, surely she knew Lia, who lived in her father’s household for 15 years. Madelyn would remember her but, of course, she’s conveniently deceased. I think Lia was poisoned. The reason they didn’t acknowledge her is because her Barry was replaced by an impostor. If she met Obama, he wouldn’t be able to recall all the experiences that Lia remembered because he was never there. She also might recall by looking at him, that he didn’t have some of the same features as the boy she remembered. It would all come back to her..but he would know nothing. It is easy for them to say they don’t know her ..because it is true. This may be the only truthful thing they have said. They are the frauds, not Lia. I wonder if she knew they were saying she was a fraud? 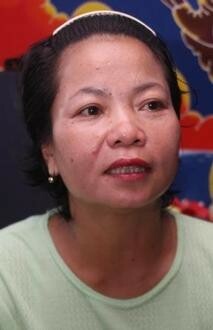 Mrs. Leah (51), adoptive brother President-elect Barack Obama, who now lives in Cibadak, Sukabumi, West Java. Yes, her death is extremely suspicious. She would recognize that he’s not the same. We can SEE with our own eyes, from the photos that have come out, that he doesn’t look like the same child. Fat, skinny, fat, skinny, crooked teeth, straight teeth, crooked teeth, on and on. Lia is why they cancelled those trips to Indonesia. Too many friends and sometime relatives lining up to “reconnect”. How long until they noticed he wasn’t the same? That he doesn’t remember the faces and places and events? AOne, Now you see that too….I have a theory about Jimi and Cass…. See page 3 for friend named David Opiyo. I tried 50 times to post but it disappears every time. Cass gave birth to a daughter named Owen Vanessa Elliot, on 26 April 1967, without naming the father. Elliot guest-starred three times on Julie Andrews’s 1973 television series, The Julie Andrews Hour. Cass’s voice blended surprisingly well with that of Andrews, given their stylistic differences, and they created a pleasing onscreen chemistry. Cass also made guest appearances on The Carol Burnett Show. Elliot was a close friend and neighbor of coffee heiress Abigail Folger, who was a victim of the Charles Manson murders. She was also close to actress Sharon Tate, writer Wojciech Frykowski, and international hairdresser Jay Sebring, all victims of the Manson madness in the summer of 1969. Singer and performer Sammy Davis, Jr. was also a good friend of Elliot and this group, and Davis has been quoted as saying that they had all been together days before the tragedy, and were it not for he and Cass each flying off to other gigs that week, they too could have been victims of the Manson Family. After the breakup of The Mamas & the Papas in July 1968, Elliot went on to have a successful solo career, even headlining briefly in Las Vegas, for the whopping contract at that time of USD$40,000 per week. Though her Vegas gig ended badly, she was a regular on TV talk shows and variety shows in the 1970s. Her most successful recording during this period was Dream a Little Dream of Me from her solo album of the same name, released by Dunhill Records. At the height of her career in 1974, having just finished performing at the London Palladium theatre, she died of a heart attack. The coroner surmised her heart had weakened to the point of failure due to Elliot’s weight and the effects of several crash diets over the years. Elliot was married twice. In 1963 she wed James Hendricks; they divorced in 1968 (Hendricks had been a member of “Cass Elliot and the Big Three,” later named “The Mugwumps”). In 1971 she married Baron Donald von Wiedenman, a journalist. It should be noted, that Mama Cass died in the exact same bed, in the exact same room, (although a few years prior), as manic drummer of The Who, Keith Moon, in an apartment owned by singer-songwriter Harry Nilsson. Wojciech Frykowski was born in Poland on December 22, 1936. His father Jan Frykowski was a small textile printer who fought with authorities to remain in control of his business after World War II. Wojciech graduated from school with a degree in chemistry, but chose to spend his time hanging around filmmakers. He met Roman Polanski at a school dance; Polanski was working the door and refused to let him in because Frykowski was a known troublemaker. According to Polanski, the altercation almost resulted in a fistfight. Some weeks later they met again, this time at a local bar, Wojciech bought Roman a drink and the two instantly became friends. Frykowski financed and produced an early short Roman made titled Mammals , but wasn’t credited because he wasn’t an official member of the film community. He was an exceptional swimmer and was hired to be the lifeguard on the set of Polanski’s first full-length motion picture, Knife In The Water . In Roman’s own memoirs he told stories of wild nights out at the bar with Wojciech, one of which included a brawl where Frykowski struck a man twice with a chair. “Beneath his tough exterior” Roman said, “Wojciech was good-natured, softhearted to the point of sentimentality, and utterly loyal.” Frykowski married twice and had a son, Bartek. One of his marriages was to the famous polish writer Agneski Osiecka. He left Poland in 1967 and after spending some time in Paris he moved to the United States. In New York, Polish author Jerzy Kosinski introduced him to Abigail Folger. Wojciech couldn’t really speak English but both he and Folger were fluent in French. For months the two lived together in New York but then decided to move out west. In August of 1968 the couple rented a car and drove to California where they took residence at 2774 Woodstock Rd., across the street from Mama Cass, in the Hollywood hills. While Abigail tutored him in English Wojciech kept a diary where he would take notes on American customs. He seemed to want to become a writer like Jerzy Kosinski and began writing poetry. He had a brief job with Paramount as a set constructor but was unhappy with the work and quit. On April 1, 1969, Wojciech and Abigail moved into Roman and Sharon’s Beverly Hills home to housesit while Polanksi and Tate were abroad working on different film projects. When Sharon came back from Italy Roman asked Wojciech if he and Abigail would stick around until he came back from England in August. By August, neither Wojciech nor Abigail seemed happy with one-another; they fought constantly and both started using drugs more frequently. Nonetheless, they stayed together and spent their summer hosting several parties at the Cielo Drive house. Through a friend, Wojciech was introduced to a group of Canadian drug dealers and allegedly agreed to traffic their drugs into Los Angeles. Frykowski’s actual involvement in the drug trade still remains a mystery and continues to generate controversy among people who believe there was a connection between him and the Manson family. Years later, Roman Polanski denied the rumors about Wojciech selling drugs, stating that the stories were just media sensationalism. It says here that his son Bartek died in 1999. Agnieszka was the only child of Wiktor Osiecki, a pianist and composer, and Maria Osiecka, a scholar. She spent her early years in the small town of Zakopane in the Tatry mountains where Wiktor Osiecki used to play the piano at the Watra Restaurant. This article is about Obamas sister, and I was wondering if you have any more information. Thanks for the link. After reviewing the politicalvelcraft article, It appears they took the first paragraph from the earlier article on Lia that I wrote, and the rest is directly from this article of Miri’s. They didn’t cite the authors or the blog. I wrote to them to do so as the information and articles are copywritten. If we found additional information, it is all in the comments . Its really weird, though. The first time I looked at the link it had a red background and completely different look. But, WTPOTUS was there too as was Leza. This same link now has the identical story and also cites WTPOTUS and Leza. This is very weird. I’ll look in my history to see if I can recapture the earlier site. New Hampshire Congressman Names Obama In Commission Of Treason! it says she’s 51 in that photo? so he is 50ish also …a good match up.